Nonlinear optical (NLO) materials have attracted lots of interests because they can be used to adjust laser wavelength and applied in laser micromachining, material processing, photolithography, optical measurements etc. NO3 has become one new hot spot for designing ultraviolet (UV)/deep-UV nonlinear optical (NLO) materials. Meanwhile, introducing some cations with d0 electronic configuration enhances commonly second harmonic generation (SHG) effect and will not influence the transmittance of UV/deep-UV. 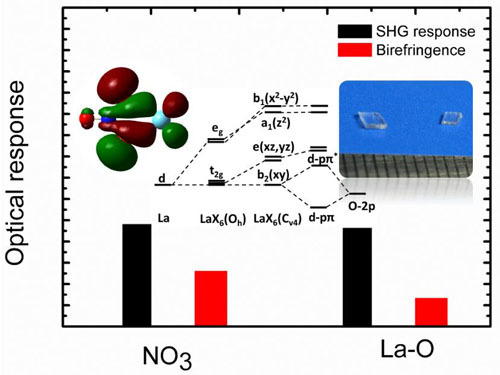 A research group led by Prof. PAN Shilie at Xinjiang Technical Institute of Physics & Chemistry (XTIPC) of Chinese Academy of Sciences developed a new crystal Na4La2(NO3)10∙2H2O containing NO3 groups and La cations which processes an anomalous high cutoff edge with dimensions up to 3 × 2 × 0.75 mm3 for the first time. In order to clarify origin of anomalous high cutoff edge and study optical properties, researchers employed the first-principles calculation to investigate the trivalent d0 transition metal nitrates and related borates systematically. The results reveal that the strong (d-p)π coupling generated from trivalent d0 transition metal and oxygen of NO3 hinders the large band gap. The strength of the interaction depends on the delocalization of O-2p orbitals in the groups, which results in apparent differences in band gaps in the trivalent d0 transition metal nitrates and related borates. Besides, by SHG-density and atom-cutting method, researchers found that the (d-p)π conjugated interaction not only enhances the SHG effect but also strengthens optical anisotropy when the electronegativities of ligands attached to lanthanum are different. Therefore, the (d-p)π interaction which was first proposed in this study to explain the hierarchical band gap, enhancement of SHG effect and optical anisotropy in optical materials will have guiding significance to search for the functional materials with targeted band gap, birefringence or NLO response. The study was published in J. Mater. Chem. C. This work was supported by the National Key Basic Research Program of China, the National Natural Science Foundation of China, etc.